Rooms within Rooms, an Image taken in Ping Yao Acient City, Shanxi Province, China…If you look carefully there is one courtyard followed by a room, followed by a courtyard followed by a room etc etc. Right in the middle at the far end is a small looking door leading into the sixth inner courtyard set of rooms, this layaout is typical for wealthy Chinese homes and dates back to the Yuan Dynasty. The sizes of courtyard houses vary greatly depending on the wealth, size, and the taste of the family, but generally the compounds had an inner courtyard (or a series of inner courtyards) and were built on a north-south axis. 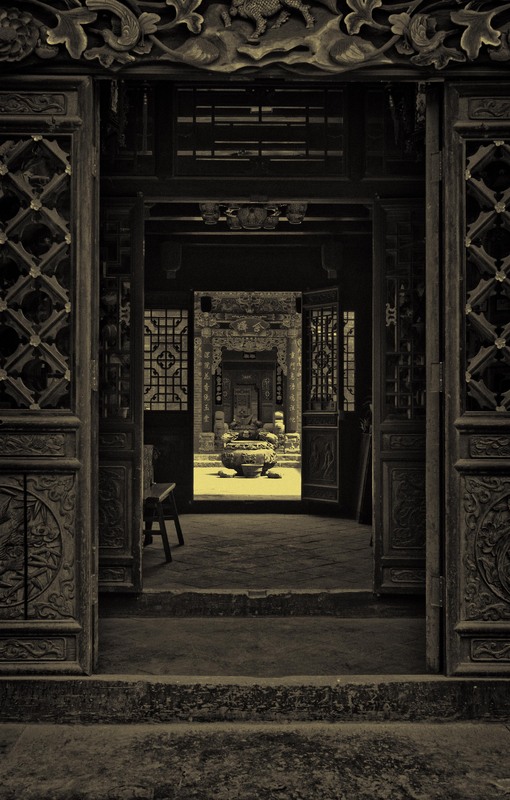 Main entrance doors to most buildings / courtyards faced south, a practice still seen today. This is just glorious! Wonderful texture. Fantastic! I love the layers of the doors and the details captured. This is without any doubt the best photograph I have seen on a blog for a long time. It draws you into a world that is tantalisingly rich and beautiful. It leaves me aching to be there. Your presentation of the photo adds to the wonderful experience. It would make a great cover picture for the book that you should write about China. Thanks so much. I really do love the detail captured here.